Popular Product Forms: Fresh (Sashimi)Southern Bluefin is considered the ultimate delicatessen of the tuna family in Japan. For Bluefin sashimi (raw tuna fillets) the Japanese are willing to pay extremely high prices, due its size, color, high fat content , texture and taste. The high price is caused by the fact that this tuna species is very hard to get. Very few markets can compete with the prices that Japanese buyers are willing pay. 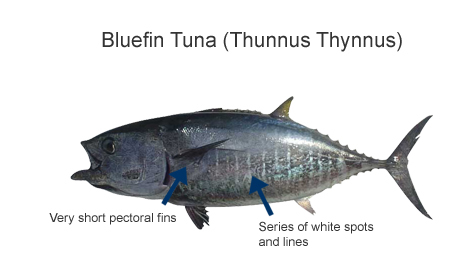 Future Supply: The Southern Bluefin tuna is the most overexploited tuna species. The stocks are heavily depleted. Japan, Australia and New Zealand have imposed restrictions on the catching of this tuna species. This situation has triggered actions by several environmental groups such as WWF and GreenPeace. Many initiatives around the world have been taken to ranch wild caught bluefin tuna in captivity, In Croatia, Spain, Marocco, Australia and Japan. This industry will continue to grow, but due to the slow growth of the big-eye and the high costs involved, it cannot fulfil the demand for bluefin in any way.